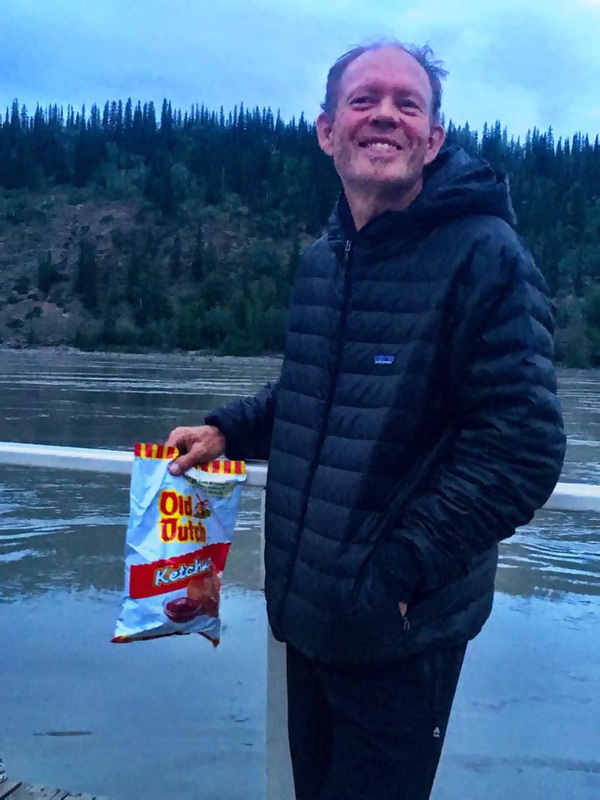 After overcoming extreme sleep deprivation and the sheer remoteness of the Canadian wilderness, endurance king Bart de Zwart reached the northern frontier town of Dawson at 2:16am local time Saturday morning to officially complete the 2017 Yukon River Quest, crossing the line after 52 hours and 16 minutes of paddling to set a new race record and claim line honours for the small but very bold stand up paddling division. Following more than two and a half days of racing, which included the 52 hours on the water plus an additional 10 hours of mandatory minimum rest at the two break points (7 and 3 hours, respectively), Bart finished this ultra-ultra-marathon two and a half hours faster when he won the inaugural SUP race last year. 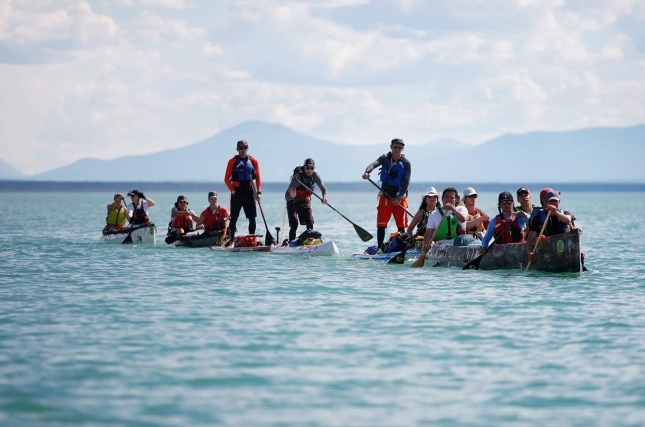 The Yukon River Quest is less of a race and more of an adventure. As Bart said in our Yukon preview earlier in the week, paddlers in this event are mainly racing against themselves and are solely focused on just reaching the finish line; while the physical challenge of this odyssey is extreme, the mental challenge is far greater. What started as a canoe race decades ago has grown into a multi-craft expedition through the Canadian wildnerness, featuring one- and two-man canoes and kayaks, along with traditional ‘voyageur’ canoes and now stand up paddle boards. This year’s overall line honours title went to a 6-person voyageur team who completed the course in 42 hours (which equals an average speed of 17km/h–the Yukon’s strong downstream current, about 4-5km/h, helps explain the incredibly fast times). According to the GPS live tracking map, the second stand up paddler, Jason Bennett, is about to cross the line in a similarly-impressive time of about 53 hours, less than an hour behind Bart. The six other stand up paddlers still out on the river are Peter Allen, Joanne Hamilton-Vale (who has added motivation to finish this year’s Quest), Carmen Merkel and Emily Matthews, while Chris Chistie and Stuart Knaack were forced to withdraw earlier in the race. Follow the Yukon River Quest on Facebook for more coverage. We’ll try and get a word from Bart (after he catches up on some sleep) at the finish line. In the meantime, here’s a quick little interview from Bart’s (and Joanne’s) fearless and sleep-deprived support man Todd Phillips, which was recorded as Bart was leaving the main rest stop at Carmacks. Jason Bennett just crossed the line as the second stand up paddler after reaching Dawson in an incredibly impressive time of 53:12:54. Incredibly, Jason was the 32nd competitor/team to cross the line in a field of 88 starters (18 have since withdrawn) that mainly consisted of much faster water craft. Peter Allen is the next paddler set to finish at approximately 6:50am local time, with Joanne the next in line as the potential first female finisher another 3 hours behind that. Follow the live GPS tracking map and the Yukon River Quest on Facebook for more coverage. @supyukon has a few videos on Instagram to give you an insight into where in the world these adventurous paddlers are right now. Here’s Bart de Zwart leaving the first of the two mandatory rest stops yesterday. This gives you a good idea of how fast the Yukon River is flowing (which explains the relatively fast race pace). Here’s a list of the final and estimated finishing times for the SUP division. Check out the full results (all divisions) plus the live GPS tracking map for more. Bart’s first meal after crossing the line? Old Dutch Chips. Thanks to Bart’s master of support and logistics Todd Phillips for the shot. Here’s a shot of Joanne Hamilton-Vale leaving the Carmacks rest stop yesterday as she ventured into the second half of the race. Jo was forced to retire from last year’s race after getting extremely ill in the first 24 hours. But current 24 hour distance world record holder was so determined to conquer the Yukon, she gave her wedding ring to one of the organisers and told them not to return it until she reached the finish line. Now that’s commitment. Also worth noting: Jo departed Carmacks at 15 minutes before midnight on Thursday night after reaching the first mandatory rest stop 7 hours earlier, meaning she will have literally paddled all night for three nights in a row (her second mandatory rest stop of 3 hours at the suitably-named ‘Coffee Creek’ was early Friday evening). According to the GPS map, Jo only has about three and a half hours to go. Congratulations to Peter Allen, team name ‘SUP N IRISH’, who just became the third stand up paddler to cross the line. Peter recorded a provisional race time of 57 hours 6 minutes after reaching Dawson just after 7am local time on Saturday. Joanne-Hamilton Vale has crossed the line in a very impressive sub-60 hour performance, reaching Dawson after 59 hours and 28 minutes. Jo famously left her wedding ring with the race organisers after retiring mid-race last year, with the clear instructions it couldn’t be returned until she reached completed the race. Congratulations to Jo for not only finishing this incredible adventure but also being the first woman over the line. The current world record holder adds another feather to her cap by narrowly beating last year’s women’s record time of 60 hours 22 minutes. Congratulations to Carmen Merkel — the 5th stand up paddler to cross the line after reaching Dawson in a time of 62 hours. Carmen crossed the finish just after lunchtime on Saturday, almost exactly 3 full days after starting the race on Wednesday (62 paddling time + 10 hours of minimum mandatory rest stops = 72 hours of racing). The final stand up paddler still on the water is Emily Matthews, who’s on track to conquer the Yukon in a time of almost 70 hours, four hours inside the 74-hour cut off. Here’s an updated list of the finishing times for the SUP division. Check out the full results (all divisions) plus the live GPS tracking map for more. 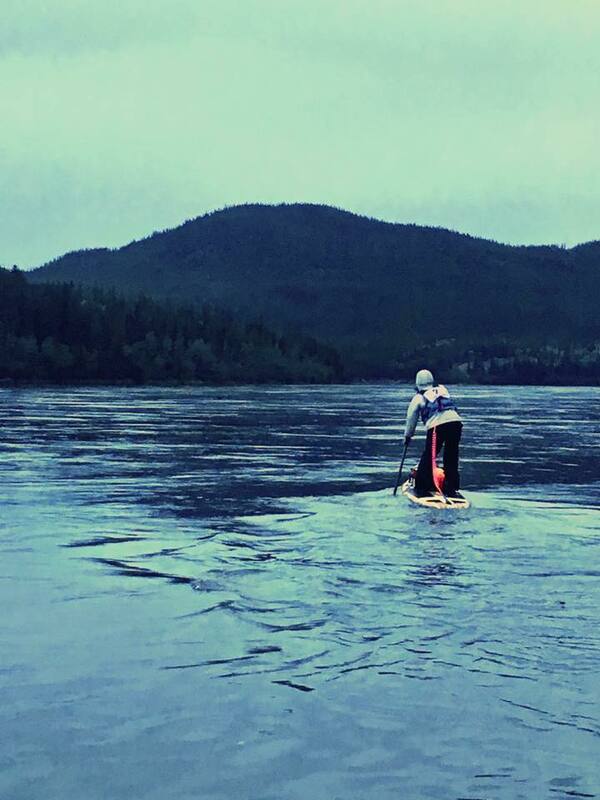 Congratulations to Emily Matthews who has just completed her epic, 715km odyssey along the Yukon River, reaching Dawson just before 8pm Saturday evening to record a race time of 69 hours and 45 minutes. The race started at lunchtime on Wednesday. Emily’s brave finish completes the stand up paddle division for this year, with 6 paddlers finishing the Quest and 2 forced to withdraw. Emily was the final paddler over the line, taking 69th place against the faster canoes, kayaks and voyageurs (19 of the 88 athletes/teams retired). See the full results from the 2017 Yukon River Quest over on the official tracking page. I just had a quick Facebook chat with a tired but very stoked Joanne Hamilton-Vale to get some insights into this crazy race. This race was always going to be tough, but it sounds like Jo was really battling out there. “During the middle of the first night out on the water, I took some anti-nausea tablets but they made me drowsy. Not long after, I fell asleep while I was on my board and fell in the water. So I had to take over 2 hours off the water to sleep after 14 hours in the race [so about 2am Thursday morning], which put me way back on my target pace. I had to claw back those two hours all the way during the race. It was beyond tough, and I had to go places within my self I don’t feel comfortable with. I also took one of the rapids wrong and rolled the board, which drenched me again. The whole journey was awesome but emotionally painful. My body, on the other hand, feels good. No pain. Ok now that every paddler is across the line, we’re going to wrap up this live blog. 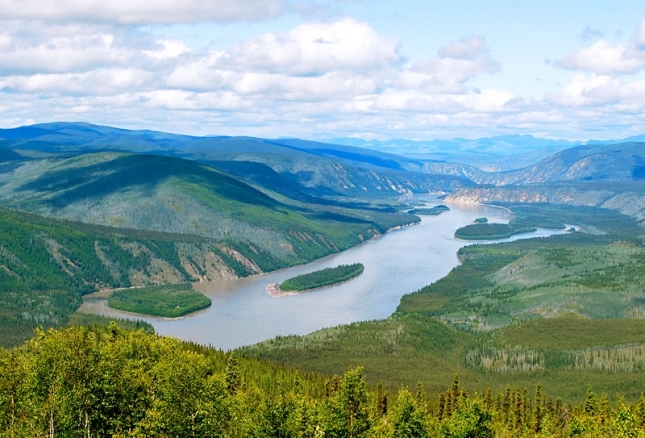 Congratulations to everyone that completed this year’s Yukon River Quest. So, who’s up for a nice little paddle through the Canadian wilderness in 12 months’ time? Follow the official Facebook page for more coverage/photos/video.